Many people in Pensacola are familiar with the intersection of 12th Ave. and Blount St. There’s two large antebellum mansions on the north side of the intersection, Blount becomes a divided road to the west, a charming Spanish style stucco home is nestled on the southeast corner and then there’s Scotland Yard on the opposite corner. You may be wondering why a housing development right in the middle of East Hill would be named after a British Metropolitan Police Service. Good question. It is a story that involves beer, fire, and a Pensacola Mayor. For those of you old enough to remember, there was a very large mansion on the property, a stately dwelling that was at one with its surroundings of live oaks, magnolia trees, and azalea bushes lining the perimiter. Most of us remember it as the YWCA. But where did the home come from? Was it always the YWCA? For answers we have to travel back further in time and find ties with one of Pensacola’s most influential families. The home was originally built in 1906 for Max Lee Bear. The Bear family name is a very recognizable one in Pensacola as it’s the family that belongs to the Lewis Bear Company. The Lewis Bear Company is a beverage distributorship that began back in 1876 and holds the regional franchise for Anheuser-Busch. 1882 ad for the Lewis Bear Company. Courtesy of Pensapedia. Max was also involved in local politics, serving first as a city council member and then as the Mayor of Pensacola from 1936 to 1937. He was also president of the San Carlos Hotel as well as a couple other businesses in town. Max Lee Bear in front of his 9,009 sq/ft. mansion named “Scotland House.” Photos courtesy of Pensapedia. He had the home built on the 2 1/2 acre site in East Hill in 1906. It was big. Seventeen rooms, and 9,009 square feet. It eventually became known as the Scotland House. (After much digging we still can’t figure out why, perhaps someone in the Pensacola Historical Society may know). 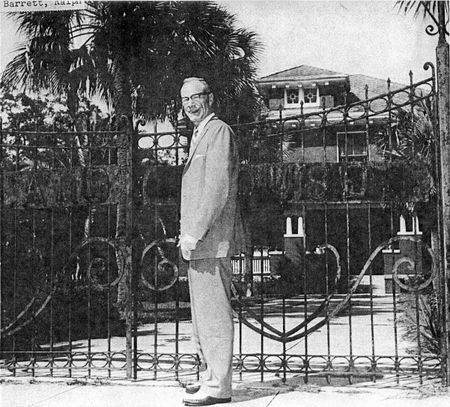 In 1914 Bear sold the home to Robert Mitchell, president of West Florida Naval Stores, who in turn sold it to D. W. McMillan in 1926. In 1940 the late Dr. McMillan’s estate donated the house to the West Florida branch of the state Children’s Home Society, who ran it as the Harry Lurton Recieving Home from 1941 to 1960. The YWCA bought the home in 1962 and remained there until 1985. In 1986 two men purchased it from the YWCA, Wilmer Mitchell (former owner’s grandson), and local architect Hugh Leitch. Their original plans were to renovate the building and turn it into an office complex called “Scotland Yard.” The plans never came to fruition so the home sat vacant for many years. Local teens called it “The Haunted House,” and would hang out inside (including this writer, I found a way in through a broken window when I was a teen). Vagrants would shelter there as well. On February 16th, 1991 the home was destroyed by a fire. Fourteen teenagers from Pine Forest High School got into the building the night before (why they were on this side of town is a mystery, Pine Forest district is at least 20 minutes away by car). Two boys used a lit palm frond as a torch and left it on the floor when they departed, causing the blaze. They were caught and charged with arson. In 1993 Mitchell and Leitch then developed “Scotland Yard” as a housing development with 20 single family brick homes on the property. Vernacular brick home in the Scotland Yard development. Photo courtesy of Zillow. 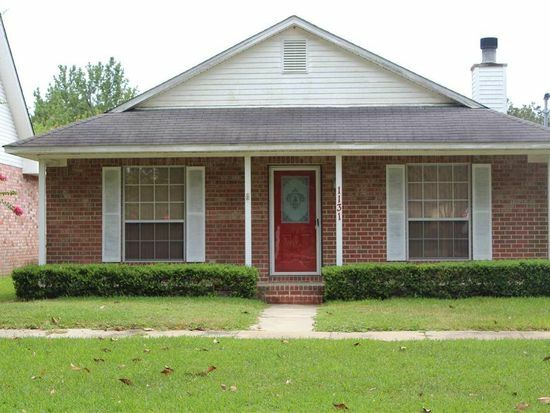 Keep visiting The Hansen Team’s blog for some more interesting stuff about Pensacola’s past and how neighborhoods and houses got to be where they are today.